California's Pacific Coast Highway is one of the best drives in the world. The West Coast, and California in particular, always seems a little ahead of the rest of North America, at least when it comes to cultural shifts and new technologies. California pioneered environmentalism, gave birth to the hippie movement and is home to Silicon Valley. The Golden State is forward-thinking. Maybe it’s the time difference. You get the feeling that Californians treat the east the same way parents treat a toddler. Once they’re put to bed, California can relax and get down to having some grownup fun. If you want to see what the world will be doing 10 years from now, all you have to do is catch a flight to California. In Los Angeles a few weeks ago, I decided to immerse myself in the latest modes of transport. Forget the “war on the car.” In Los Angeles, every conceivable form of transportation is competing against the other. 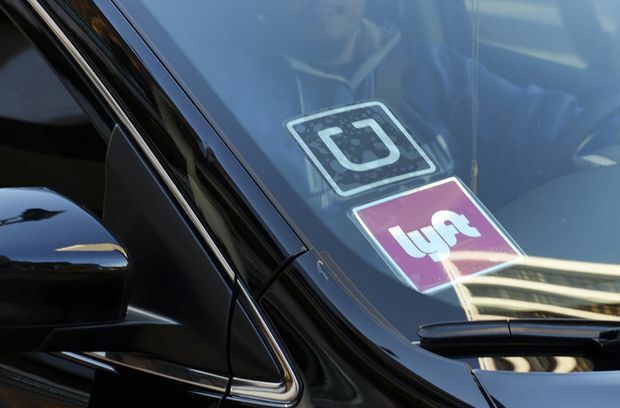 Ride-hailing services like Uber and Lyft have change transportation around Los Angeles. It was counter-intuitive. But in doing the math, it started to make sense. A rental would cost me around US$300 for a week, then there would be a daily parking fee at my hotel, and parking charges between US$10 and US$20 per destination, plus gas. So I used ride-sharing, and I was amazed. I didn’t have to wait more than four minutes to get a car. The rates were cheap. A 25-minute ride from Santa Monica to West Hollywood, for instance, was $26. I’d have paid $15 in parking and would have gotten lost at least once. I saved around $150 by ride-sharing instead of renting a car – and learned a lot about Los Angeles from my drivers. Ride-sharing has changed the way Los Angeles parties. Every comedian or writer I met seemed to echo that sentiment. Canadian ex-pat screenwriter Brent Piaskoski told me, “Before, all the comedians and writers drove to shows. Now they all Uber. That means they can drink and do other things. It’s even more of a party.” Same goes for their audiences. Los Angeles is ground zero for e-scooters, particularly west side communities such as Venice, Marina Del Rey and Santa Monica where flat topography and well-maintained roads are ideal for testing new forms of personal mobility. When you walk in Santa Monica, you have to keep an eye out for two-wheeled tourists zipping along the sidewalk. Services such as Bird and Lime rent e-scooters. To use one, all you have to do is download the app, create an account and hop on. Typical users seem to be tourists out for a joyride or locals using the e-scooters to commute to the Metro Expo Line station or for short spur-of-the-moment trips. 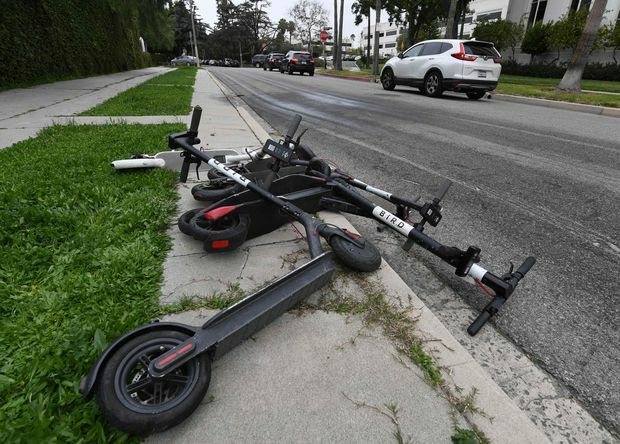 E-scooters from companies such as Bird and Lime often litter the sidewalks in some Los Angeles communities. While popular with riders, they aren’t viewed with much affection by everyone else. E-scooters are to be used only on roads and in bicycle lanes – a bylaw no one appears to obey. They’re on sidewalks, roads, everywhere – and they’re not easy to keep track of. I tried stepping on one and felt singularly unsafe. Last week, a 41-year-old riding an e-scooter in Santa Monica was killed in a hit and run. When I polled my Uber drivers about e-scooters, the response ran from a frustrated sigh to a stream of invective. As ubiquitous as they are in Los Angeles, it’s hard to imagine e-scooters in northern cities. Our ice and snow and pothole-ridden roads would make a trip on an e-scooter a virtual suicide mission. As much as people use ride-sharing and e-scooters, the majority of Los Angeles residents drive their own cars. Congestion is epic. During rush hour you can expect to take an hour to get anywhere. There’s nothing fun about driving in Los Angeles. Driving on the Pacific Coast Highway – the 951-kilometre stretch of highway that runs along the coastline from San Diego to San Francisco - is another matter entirely. It’s hailed as one of the best drives in the world, and it is tops on my personal list. So, with a morning off, I rented a Mini Cooper Convertible from a Sixt premium car rental at the hotel and went north through Malibu. With the top down – screaming “tourist” to any Californians who saw me – I drove past the beaches and bright blue ocean and then by the farms and fields near Oxnard. The Bixby Bridge, near Big Sur, Calif., is part of the scenic Pacific Coast Highway. We’re talking a mind-clearing, soul-rejuvenating pleasure cruise. A convertible allows you to feel the wind, hear the world around you and absorb that golden California sunshine. It sure beats the Gardiner Expressway in March. If only every drive was like that. Perhaps in the future we’ll have public transit and ride-sharing for our daily trips, and, once in a while, we’ll rent ourselves a sporty car and take it for a spin. We may not have the Pacific Coast Highway in Canada, but I hear the Fundy Coastal Drive in New Brunswick is pretty spectacular.